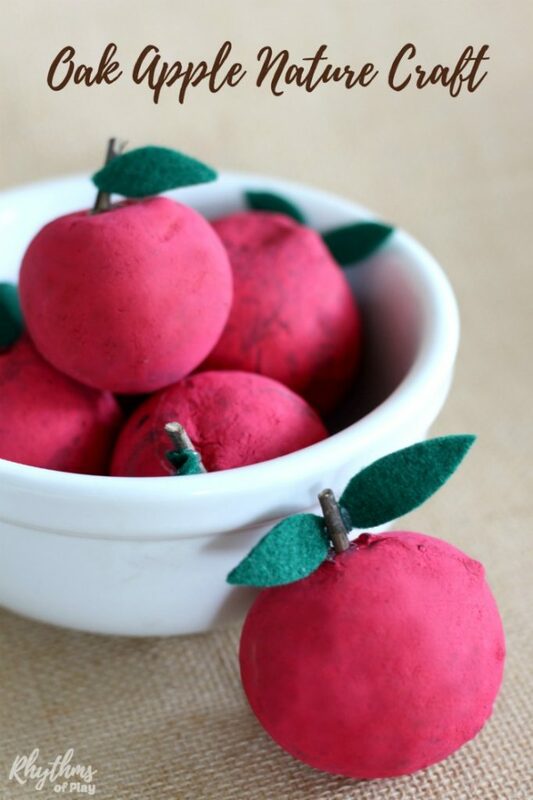 An apple craft for kids and adults made out of oak apples! Oak apples, also known as oak balls or oak galls, are a large round apple-like structure often found on and around oak trees. 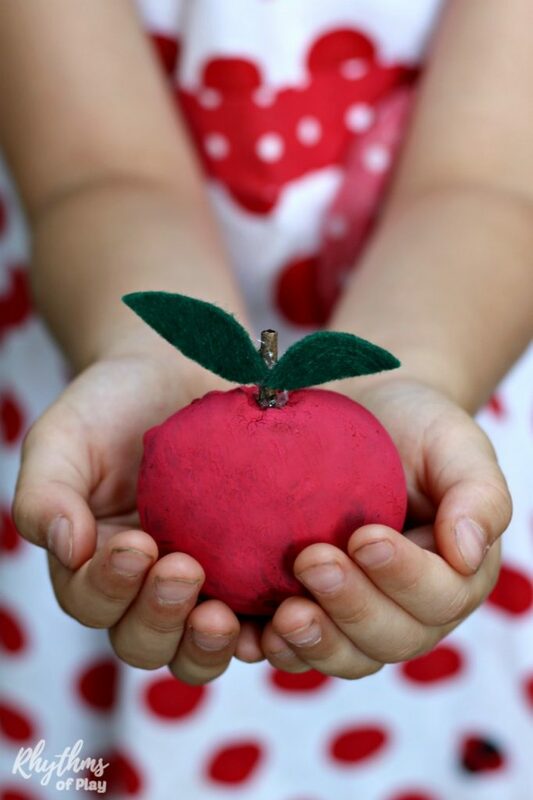 Make this apple nature craft with your children to add a rustic touch to your DIY home decor today! My daughter and I have always called these strange growths oak balls. 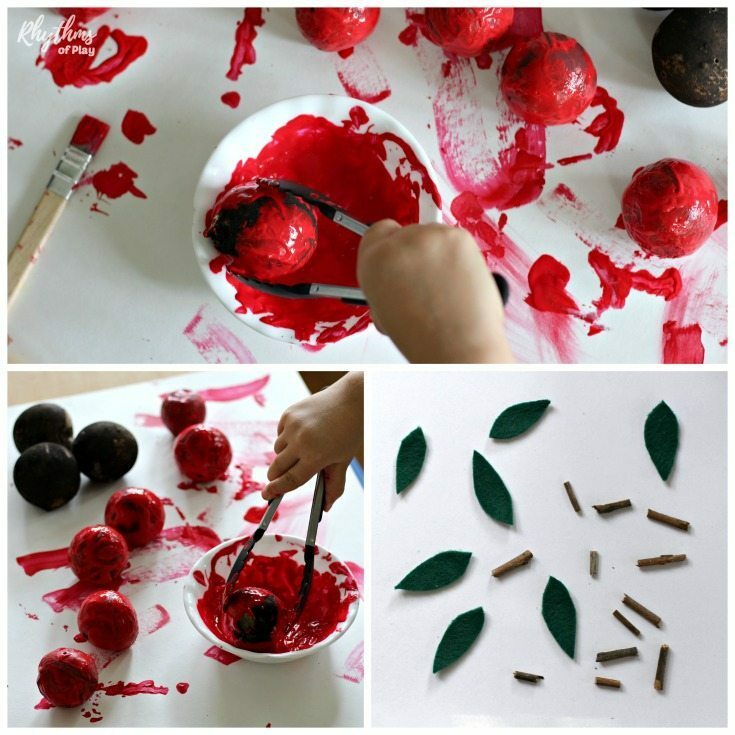 We thought they looked so much like apples that we decided to paint them red and add twigs and felt leaves to make them look even more like apples. Imagine our surprise when we studied up on them and learned that they are called oak apples! Where do you find oak apples? You can find oak apples or oak galls on the roots, branches, and leaves of oak trees. You can also find them laying on the ground where oak trees grow. Oak apples are caused by the larva of a species of wasp called a gall wasp or gallfly. Oak galls develop when the female insect lays her eggs and the hatching larvae feed on the nutritive tissue of the galls. Exactly how is unknown, but it is largely believed to be formed by chemical, mechanical, and/or viral triggers. Step 1 – Go on a nature hunt to collect oak balls or galls and some twigs. To find oak galls, look on oak trees and on the ground where oak trees grow and you should spot plenty! Preheat oven to 200 degrees Farienheight. Place Oak galls on a baking sheet lined with parchment paper and bake for 20-30 mins to kill any remaining pests. Allow oak galls to rest for 24 hours before crafting with them. Squirt red tempera paint into a small bowl. Invite your child to use a paintbrush and/or small tongs to roll it around in the paint until all surfaces are covered. We tried both. My daughter found it easier to use tongs. Allow painted oak apples to dry. Use a glue gun to attach a twig and a leaf or two to each oak apple. Once finished these cute little oak apples make great rustic home decor. They are also the perfect item to display on nature tables and make a great addition to a homeschool apple unit study. Don’t forget to check out our collection of nature crafts and nature art activities that use natural materials, and our fall bucket list for the best autumn ever for more fun ideas! « Halloween Art Projects Kids Love!